Indian Railways e-Procurement System (IREPS) portal was launched in 2008 (25th August) for procurement of Goods, Works & Services, Sale of Materials, and Leasing of Assets through the process of E-Tendering, E-Auction or Reverse Auction. Sale of scrap materials through e-auction was launched in March 2012 through this portal. 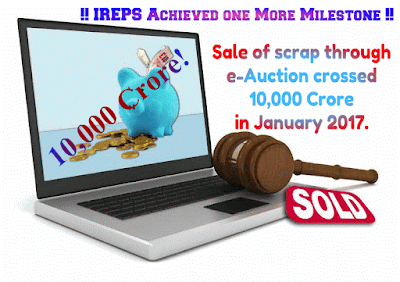 Last month (January 2017) sale of scrap through e-auction crossed to 10,000 (Ten Thousand) crore which is a big achievement for IREPS. IREPS provides a secure platform to users for online transactions for scrap sale. Depot users of Indian Railways can schedule E-Auctions and publish the Auction Catalogue for view by all users. Registered bidders can submit their bids online without knowing the identity of other bidders. They can make online financial transactions through electronic payment facilities provided with different payment gateways. In May 2016, the no. of tenders published through IREPS portal has been crossed over 10,00,000 (10 Lakhs). Is this information was helpful for you?